Excessive lumbar flexion is widely recognized as a common mechanism of lower back injury. As such, minimizing spine flexion in an attempt to reduce tissue stress is a primary objective in the treatment of many back pain patients. And this needs to be done as early as possible in the treatment process. However, most of these patients have developed poor movement patterns that utilize spine flexion over hip flexion. Instructing patients to simply stop these movements is not going to cut it. Most of these patients lack the ability to do this. These deficient patters are can be related to physical impairments. Most commonly these will include restrictions in the posterior hip or hamstrings that limit hip flexion mobility. 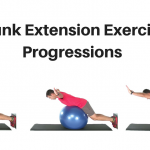 Trunk extensor weakness is also common. But movement patterns are not just dictated but strength or flexibility parameters. They are deeply ingrained habitual patterns that are learned over time. Restricted or weak muscles are part of the patterns that need to be addressed. But patients also need to specifically re-train the offending movement pattern. In this case, they need to learn how to bend forward with the hips, not the spine. That’s where the hip hinge progression comes in. 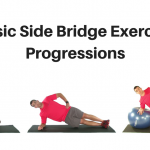 The hip hinge is a series of exercises that can be used to help patients learn to move through the hips while at the same time holding the lumbar spine stable. Essentially we are trying to train the trunk to bend forward utilizing hip flexion while the spine remains in a neutral posture. 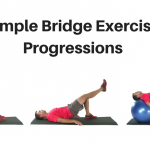 What follow is a series of 3 exercises to help patients learn to bend forward on the hips. 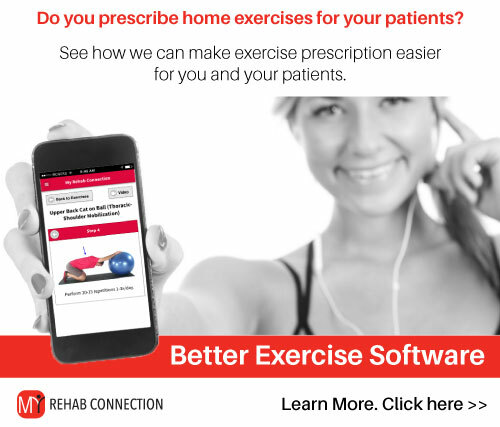 Patients should do these exercises as part of a formal exercise/rehab program. But they should also try to use this hip hinge pattern with daily activities to spare the spine and reduce stress to damaged or vulnerable tissue. With the hip hinge we are trying to teach the patient how to move the trunk on the hips. To do this we start in the quadruped position and simply rock the hips back towards the heels. The key here is to not allow the lumbar spine to flex. To prevent this instruct the patient to hold a slight anterior pelvic tilt (APT) and abdominal brace during the movement. The APT acts to engage the multifidi and deep paraspinals which will stabilize the lumbar spine and focus the motion at the hips. As the patient rocks back and forth they need to focus on feeling the motion at the hips. 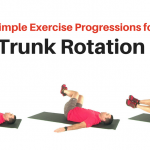 This helps to learn how it feels to move through the hips with a stable spine. 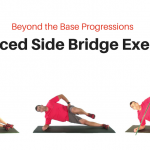 The next exercises build on this base movement. The next step is to move to a more upright posture. This is done with the Kneeling Hip Hinge exercise. Performing this movement from the knees takes the feet and ankles out of play. 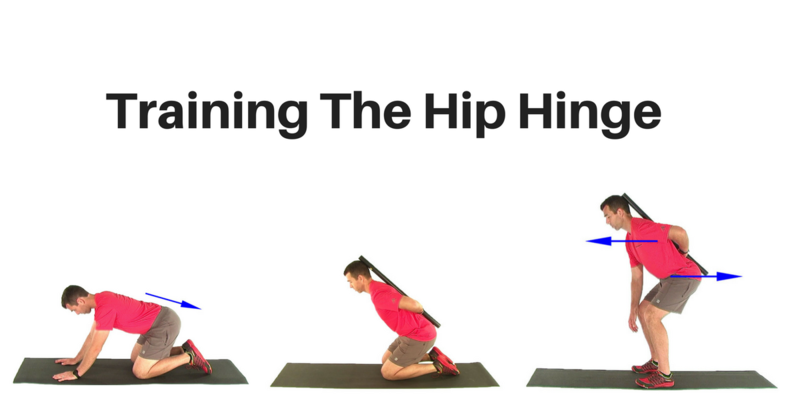 This simplifies the movement so the patient can focus solely on the hips and trunk. The key with this exercise is to focus on the shoulders and trunk leaning forward as the hip slides back towards the heels. Once again, a slight APT and abdominal brace can be held to stabilize the spinal joints. A dowel or broomstick can be held lengthwise along the spine to help provide feedback. The dowel will contact the sacrum and mid thoracic spine (and hopefully the head), with the hand holding the dowel resting against the lower back. If the broomstick looses contact with the spine as the patient bends forward it signals a faulty movement. Augmented feedback plays an important role in re-training movement patterns. In this case the dowel provides an objective indicator of success or failure. Failure keys the patient that they need to alter the movement. Success reinforces the desired pattern. Finally we take the principles learned in the previous exercises and apply them to the full upright position. This is done with the Standing Hip Hinge exercise. Again, the focus is on the hips moving back as the trunk and shoulders move forward. This hips back/shoulders forward pattern keeps the center of mass over the feet. The patient usually needs to be cued that it is OK to flex the knees with this movement. Just as the previous exercise, a broomstick or dowel can be used to provide feedback. In the initial stages the focus is on quality of motion, not range. As the patient develops more competency they can work on bending further towards the floor. The dowel can also be removed.